4 kilometer away from Janpath to the northeast of Feroze Shah Kotla near Delhi Gate at Ring Road on the bank of Yamuna is situated Rajghat. Jawaharlal Nehru Road also ends opposite Rajghat. On 31st January 1948, Mahatma Gandhi's last rites were performed over here. 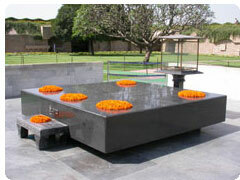 The memorial stone of Gandhi is square in shape made of black stone. His last word- 'Hey Ram' is inscribed on it. Ordinary people, VIPs, foreign tourists all come at Rajghat to pay their homage to the Father of the Nation. On every Friday (the day of his death) a prayer is held. Except Monday, a regular feature of projecting Gandhi philosophy in picture, sculpture and photos from 10.00am to 5.00pm is performed at Rajghat. Besides, there is Gandhi Memorial Museum projecting Mahatma's life and the philosophy of Sarvodaya Movement in film shown from 9-30am to 5-30pm except on Thursday and on Sunday at 6pm in Hindi and 7pm in English, 4 and 5pm in winters. Another Gandhi Memorial is Gandhi Balidansthal or Assassinated Spot at Tis January Marg of the city. On 30th January 1948 on his way to prayer at Birla Bhawan, Gandhiji was assassinated by bullets. Photography / Videogrpahy: Both still camera and movie camera are allowed free of charge.